Haglund's deformity is a bony bump on the back of your heel. Haglund's deformity typically develops in people who wear shoes with stiff, closed heels. 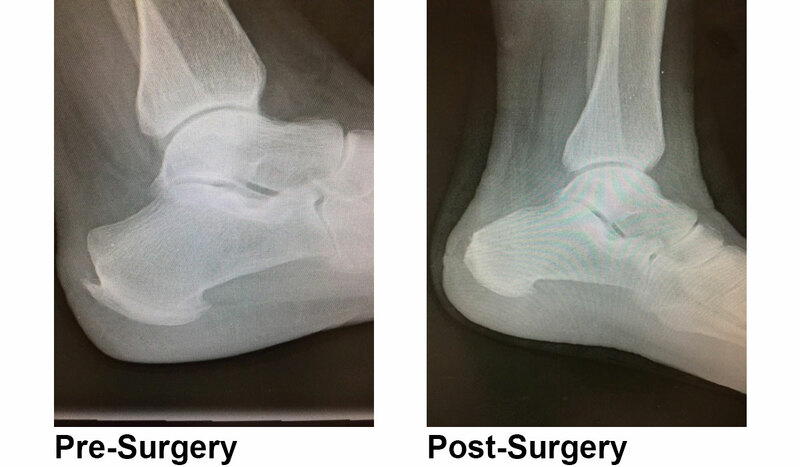 Your risk of developing Haglund's deformity also depends on the shape of your heel bone. Both surgical and nonsurgical treatments are available to relieve the pain associated with Haglund's deformity. Haglund's deformity is an abnormality of the foot bone and soft tissues. An enlargement of the bony section of your heel (where the Achilles tendon is located) triggers this condition. The soft tissue near the back of the heel can become irritated when the large, bony bump rubs against rigid shoes. This often leads to bursitis. (Bursitis is an inflammation of the fluid-filled sac between the tendon and the bone.) When the heel becomes inflamed, calcium can build up in the heel bone. This makes the bump larger and increases your pain. The condition may worsen causing degenerative tearing of the achilles tendon insertion. Haglund's deformity occurs when there’s frequent pressure on the backs of your heels. It may be caused by wearing shoes that are too tight or stiff in the heel. Since it often develops in women who wear pump-style high heels, Haglund's deformity is sometimes referred to as a “pump bump.” You may also be more at risk for getting Haglund's deformity if you have high foot arch, have a tight Achilles tendon, or tend to walk on the outside of your heel. Haglund's deformity can be difficult to diagnose because the symptoms are similar to those associated with other foot issues, including achilles tendonitis. Your doctor might be able to diagnose the condition based on the appearance of your heel. Your doctor may X-ray of your heel bone if they think you have Haglund's deformity. This will help your doctor determine whether you have the prominent heel bone associated with the disease. Surgery can also be used to treat Haglund's deformity if less invasive methods don’t work. During surgery, your doctor will remove the excess bone from your heel. The bone may also be smoothed and filed down. This reduces the pressure on the bursa and soft tissue. You may be given a general anesthesia that will put you to sleep during the surgery. This is usually done if your Achilles tendon is damaged and your doctor needs to fix it. After surgery, it will take up to 3-4 months for you to get back to all activities including sports. Your doctor will likely give you a boot or cast to protect your foot. You may also need to use crutches for a few days. The cut will have to remain bandaged for at least seven days. Within two weeks, your stitches will be removed. Your doctor may want to get an X-ray of your foot on follow-up visits to ensure that it's healing properly.